In the past 2000 years, two major world religions have emerged from the sandy peninsula we now call the Middle East: Islam and Christianity. While these two religions vary in history, belief, and practice, they also have many similarities. Islam : in 610CE, God gave his first declared revelation to the Prophet Muhammad at a cave in Hira. The first year of the Islamic calendar begins in 622CE, when the Prophet Muhammad and his followers moved to Medina. Christianity : Jesus Christ was born in 1CE in Bethlehem. When he was thirty, he began to preach the word of God. In 33CE, Jesus was crucified in Jerusalem; Christians believe he was resurrected three days later and eventually ascended into heaven. Christianity : believe that God sent his only son, Jesus, to save them from sin. Those who believe in the Father, Son, and Holy Spirit will have eternal life. Islam : there are five pillars that create the core Islamic practices. Shahadah is the recitation of their fundamental belief. Salah is the ritual prayer that must be said five times a day. Zakat is the giving of charity to the poor. Sawm is fasting during the month of Ramadan. Hajj is a once in a lifetime pilgrimage all Muslims make to Mecca. Christianity : asks its followers to attend church every Sunday. They should confess their sins and partake in communion. Penance for sins can include alms-giving or good works. Began in the Middle East and consider Jerusalem to be a holy city. Are monotheistic – believing in a single supreme being. Have been successful proselytizers, spreading far beyond the Middle East to become world religions. Have a holy book in which they believe the word of God is written. Espouse daily, weekly, and yearly rituals and ask their followers to adhere to a specific moral code. Have had internal division, leading to different branches or sects. 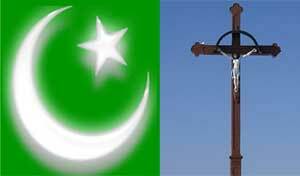 1.Both religions were founded by the works of one man, with Islam beginning 600 years after Christianity. 2.Islam believes Mohammad was a prophet while Christianity believes Jesus was the son of God. 3.Islam asks its followers to adhere to the Five Pillars while Christians do most of their formal worship on Sundays. Manisha Kumar. "Difference Between Islam and Christianity." DifferenceBetween.net. August 23, 2011 < http://www.differencebetween.net/miscellaneous/difference-between-islam-and-christianity/ >. I agree with Blouin’s point. And at the same time, to be a follower of Jesus is to do what he’s done, which is feeding the hungry, visiting the imprisoned, caring for the sick and shut in, clothing the naked, loving God, loving the tangible (each other) before talking about loving the intagible (God — how can we talk about loving God while hating each other? ), loving one another as ourselves, and loving our self… not for the sake of pentinence (this is not community service) or salvation (we’re saved through grace, not works) or whatever, but for the sake of love of God and each other. This site is awesome, but I think this is a very poor and innacurate explanation of Christian practice… despite denominational practices, just talking about general Christianity practices. Hopefully the provided explanation for Muslim practice is more accurate. One thing about trying to do anything is someone will come along and be able to say it is no good. I wonder if you could help us all understand the difference between these two religions, you seem pretty adept, verbally? John Blouin and KS Harris… I think you are both right… James 2:17-19 says that faith without works is dead but those works should be a natural response to the grace and love shown to us by Jesus. I would sure like to hear some Muslims weigh in on the Islamic explanation. Christianity has nothing to do with penance, salvation is tru faith alone tru Jesus Christ alone. Salvation is not tru good works, this of course should naturally come after accepting Jesus Christ into your heart and believing tru faith alone. As for communion and confessing your sins, Jesus Christ is our only mediator to God the Father, not a priest who is only a man who is fallible. Also there is no such thing as purgatory, it does not exist, no amount of prayer or alms for the dead will help get them into heaven, they had their chance while alive. I also have to add that I grow tired of people stereotyping Muslims as I have met many good Muslims whom I would be proud to have as a friend. There are good and bad as there are Christians. Islam started before Christianity and Prophet Muhammad was not the only prophet he was the last and the first to receive the first doa from Allah. Please prove it with Historical or Classical references. (2) Prohibition of Pork:- //BIBLE: Leviticus 11:7-8; Deuteronomy 14:8; //QURAN: 2:173, 5:4, 6:145, 16:115. (3) Prohibition of Usury (Interest on Money/Loan/Credit):- Manu Smriti: 11:62, 8:152; //BIBLE: Leviticus 25:36-37; Ezekiel 18:13, 22:12; Psalms 15:5; //QURAN: 2:275, 3:130. (4) Permission for Non-Vegetarian Food:- Ramayana: 2:20:29, 2:20:17-18; Manu Smriti: 5:30, 39; Mahabharata: 13:88; //BIBLE: Deuteronomy 14:4-6, 14:11; Leviticus 11:3; //QURAN: 5:2, 6:142, 16:5, 23:21. (5) Permission for Multiple Spouses (Wives/Husbands):- Ramayana: 2:8:12, Dasaratha; Mahabharata: Draupadi, Krishna; //BIBLE: 3Kings 11:3; 2Kings (2Samuel) 5:13; 2Chronicles 11:21; Exodus 21:10; Deuteronomy 21:15; //QURAN: 4:3. (6) Veil/Head Scarf/Modesty:- Rig Veda: 8:33:19; //BIBLE: 1st Corinthians 11:5; //QURAN: 24:30-31, 33:59. (7) Oneness of God & Prohibition of Idol Worship:- VEDA: Yajur Veda 32:3, 40:8-9; Rig Veda 1:164:46, 6:45:16; UPANISHAD: Khandogya: 6:2:1, Shwetashvatara 6:9, 4:20; GEETA: 7:20, 10:3; BRAHMA SUTRA; //BIBLE: Leviticus 26:1; Exodus 20:4; //QURAN: 2:163, 2:255, 4:171, 7:191, 16:20, 25:3, 112:1-4. (8) Prophet Muhammad’s Description:- Bhavishya Purana: Prati Sarag: Parv III: Khand 3: Aday 3: Shloka 5-8, 10-27; Samveda: Book II: Hymn 6: Verse 8; //BIBLE: Deuteronomy 18:18; John 14:16; //QURAN: 3:144, 47:2, 48:29, 61:6. Jerusalem is not the holy city it’s Mekka. I have no questions about what I have read today. Infact all I have read today has been quiet helpfull. Thank you. I now know my what my true religion of life is to be. ISLAM. (1) One quistion I do have for you is this. In islam you pray five times a day in the derection of mecca. I live in portland,oregon so which way is mecca. (2) I know I said I only had one quistion for you, I was wrong. I have a second quistion. What is mecca & what does it mean. Mr Dennis, Please read the new testement of the Bible. If for no other reason than to increase your knowledge. the description of christianity on this site is not quite accurate and is sufficiently lacking in information. I can’t speak for Islam as I am a Christian. You have nothing to lose by reading the ministry of JESUS.. Or you can ask GOD (jehovah/yaweh) to guide you;. But if you go that way, hold on. He will prove himself to you but it can be a hard and narrow path. as the bible says , it is a narrow gate you must enter, don’t take the broad gate that is easier filled with the multitudes for it leads nowhere good. GOD bless and I hope to see you in Heaven. I just want to say that Christianity and Islam are a lot alike. Those who are offended because their beliefs are challenged shouldn’t be. I don’t think that the purpose of this website was meant to offend to create more hostility between all of us. The Bible has a lot of the teachings that the Quran even if people don’t think that, they can read the Bible and the Quran for themselves and interpret it for themselves. That is why it is in all languages now and we can go out and discover what we need without relying on anyone else. The Quran isn’t full of hatred, but I the media and people of higher power has used verses from the Quran and misinterpreted them for their own advantage. I have a lot of Christian friends and alhamdulilah neither do they hate me or treat me different because Im Muslim and I do the same. The Quran taught me that. Then tell me how Muslims can behead a human being ? if you really choose Islam I have to say”Congratulation”to you,Islam is the best religion in the world.The religion of Peace.Don’t believe that Islam is based on Terrorism. You have to see the religion”Islam” & act how the God & religion said not the followers “Muslims” and their works! !Read Quran carefully. The exactly meaning of Mecca is:A place that there is Kaaba in it.The other meaning is the place where the people make a community. I read that in a book, named “Al-Monjed” is an Arabic dictionary. I hope that this article will be helpful. And excuse me because I can speak English very well. Which part it is full of Hatred < show me if you are Speaking the truth ? To the guy who made the comment about Isalm being filled with hatred, I’ve got news for you buddy, the Bible is just as hate filled as the Qu’ran. Both books contain hate & violence, & what’s more fucked up is both books, in so many words, advocate for you to kill anyone who tries to dissuade you from that religion. Which, one could say, in a way, I am doing. Do you believe that I should be killed? It’s sad that people fight over these silly little books when it is so clearly evident that they were created by men. Whatever. I’m not going to waste anymore time, I just wish you people would stop presenting your religion to your children as the only true religion & let them make up their own minds. What an interesting question- Mecca, or defining where it is in relation to Portland, reveals so much. Mecca is downward from here, but here is downward from Mecca. Point your finger generally towards the ground, through it. Please tell me you haven’t made your decision on which religion you feel most comfortable with based solely upon the quick, and somewhat faulty overviews & generalizations of this web page. You should make a decision as important as your personal religious ideology on more than this. A quick warning though: If Islam truly is the one that you feel aligns best with your values, then go for it and God bless you. However, be aware that there are a lot of hazards that come with following Islam, both from within, and from the outside. The more dangerous obstacles will come from within Islam as the 3 factions —Shi’a, Sunni, Kurd—have been locked in conflict and civil war for generations now. You will also find that the practice of Islam can be very stifling and oppressive at times. To the practitioners who adhere to Sha’ria Law especially, who are typically the most devout/extremist followers inside Islam, something as seemingly inconsequential as missing mosque or wearing the wrong robes/dress style can be grounds for violent punishment & being labeled an infidel. Also, at some point you will absolutely encounter the more militant minded ones who espouse the practices of rogue groups such as ISIS, Al Queda, and the Taliban within the Muslim community. It is a very real, very tangible threat that you will certainly be confronted with at some point or another while practicing Islam. These people will be in the minority of course, but they do exist, and you will face this eventually. So just be careful and remain both astute & vigilant at all times. There are snake pits within the Muslim community because Islam has never been institutionalized, and later reformed the way Christianity has. Whereas Christianity has a physical seat of power in the Vatican, and has left it’s dark ages behind centuries ago during the Medieval era, Islam’s medieval period is right here, right now. I’m not talking about hypocrites inside of Islam right now— everyone has hypocrites. No, I’m talking about a genuine sickness and blight upon the soul of Islam nowadays that has gone viral in recent years. 1)	Islam – A Religion Based on Terrorism. 2)	No evidence at all going for it. 4)	Prophet Mohammed says that if a Muslim discards his religion, kill him. 6)	Just do what we say and everything will be fine. 7)	All land is Muslim land. 8)	Brutality of HUD punishments. 9)	I will never condemn a Muslim. 10)	Shariah Law should be the law of the land and forced on all people. 11)	Absurdities, contrivances and contradictions in the Qur’an. MY Brother and Sisters, how can Islam be a peaceful religion when it commands its followers to do the following? 1)	[2.191] And kill them wherever you find them, and drive them out from whence they drove you out, and persecution is severer than slaughter, and do not fight with them at the Sacred Mosque until they fight with you in it, but if they do fight you, then slay them; such is the recompense of the unbelievers. 2)	[3:28] Let not the believers take the unbelievers for friends rather than believers; and whoever does this, he shall have nothing of Allah, but you should guard yourselves against them, guarding carefully; and Allah makes you cautious of (retribution from) Himself; and to Allah is the eventual coming. 3)	[3.151] We will cast terror into the hearts of those who disbelieve, because they set up with Allah that for which He has sent down no authority, and their abode is the fire, and evil is the abode of the unjust. 4)	[4.34] Men are the maintainers of women because Allah has made some of them to excel others and because they spend out of their property; the good women are therefore obedient, guarding the unseen as Allah has guarded; and (as to) those on whose part you fear desertion, admonish them, and leave them alone in the sleeping-places and beat them; then if they obey you, do not seek a way against them; surely Allah is High, Great. 5)	[4.76] Those who believe fight in the way of Allah, and those who disbelieve fight in the way of the Satan. Fight therefore against the friends of the Satan; surely the strategy of the Satan is weak. 7)	[8.12] When your Lord revealed to the angels: I am with you, therefore make firm those who believe. I will cast terror into the hearts of those who disbelieve. Therefore strike off their heads and strike off every fingertip of them. 8)	[8.69] Eat then of the lawful and good (things) which you have acquired in war, and be careful of your duty to Allah; surely Allah is Forgiving, Merciful. 9)	[9.5] When the sacred months are over slay the idolaters wherever you find them. Arrest them, besiege them, and lie in ambush everywhere for them. If they repent and take to prayer and render the alms levy, allow them to go their way. 10)	[9.5] When the sacred months are over slay the idolaters wherever you find them. Arrest them, besiege them, and lie in ambush everywhere for them. If they repent and take to prayer and render the alms levy, allow them to go their way. 11)	[9.14] Fight them, Allah will punish them by your hands and bring them to disgrace, and assist you against them and heal the hearts of a believing people. 12)	[9.29] Fight those who do not believe in Allah (Jews and Christians), nor in the latter day, nor do they prohibit what Allah and His Apostle have prohibited, nor follow the religion of truth, out of those who have been given the Book, until they pay the tax (jizya) in acknowledgment of (Islamic) superiority and they are in a state of subjection. 13)	[9.30] And the Jews say: Uzair is the son of Allah; and the Christians say: The Messiah is the son of Allah; these are the words of their mouths; they imitate the saying of those who disbelieved before; may Allah destroy them; how they are turned away! 14)	[9.33] He it is Who sent His Apostle with guidance and the religion of truth, that He might cause it to prevail over all religions, though the polytheists may be averse. 15)	[9.123] O you who believe! Fight those of the unbelievers who are near to you and let them find in you hardness; and know that Allah is with those who guard (against evil). 16)	[22.39] Permission (to fight) is given to those upon whom war is made because they are oppressed, and most surely Allah is well able to assist them. 17)	[33.61] Cursed: wherever they are found they shall be seized and murdered, a (horrible) murdering. 19)	[48.28] He it is Who sent His Apostle with the guidance and the true religion that He may make it prevail over all the religions; and Allah is enough for a witness. 20)	[48.29] Muhammad is God’s apostle. Those who follow him are ruthless to the unbelievers but merciful to one another. 21)	[61.9] He it is Who sent His Apostle with the guidance and the true religion, that He may make it overcome the religions, all of them, though the polytheists may be averse. 22)	[62.6] O ye who are Jews! If ye claim that ye are favoured of Allah to the exclusion of all mankind, and then long for death (as believers do) if ye are truthful. 1)	Regarding infidels (unbelievers), they are the Muslim’s “inveterate enemies” (Sura 4:101). Muslims are to “arrest them, besiege them and lie in ambush everywhere” (Sura 9:5) for them. They are to “seize them and put them to death wherever you find them, kill them wherever you find them, seek out the enemies of Islam relentlessly” (Sura 4:90). “Fight them until Islam reigns supreme” (Sura 2:193). “Cut off their heads, and cut off the tips of their fingers” (Sura 8:12). 2)	If a Muslim does not go to war, Allah will kill him (Sura 9:39). He is to be told, “the heat of war is fierce, but more fierce is the heat of Hell-fire” (Sura 9:81). 4)	Muslims are to be “ruthless to unbelievers” (Sura 48:29). 5)	Muslims are encouraged to be wholly occupied (Sura 2:273) with fighting for Allah’s cause. 6)	Muslims are encouraged to be wholly occupied (Sura 2:273) with fighting for Allah’s cause. 10)	Anyone who fights against Allah or renounces Islam in favor of another religion shall be “put to death or crucified or have their hands and feet cut off alternative sides” (Sura 5:34). 11)	Allah loves those who “fight for his cause” (Sura 61:3). 12)	A Muslim should “enjoy the good things” he has gained by fighting (Sura 8:69). 13)	Muslims must make war on the infidels (unbelievers) who live around them (Sura 9:123). 14)	A Muslim can kill any person he wishes if it be a “just cause” (Sura 6:152). 15)	Allah will give “a far richer recompense to those who fight for him” (Sura 4:96). Dear Brother and Sisters, please revealing Suras (or Chapters) in the Quran and directly from the Arabic text Quran. You are therefore, requested to please convey my message to all my other Christian brothers and sisters for their necessary information, God bless you, thanks. “Lord Jesus I believe you are the Son of God. Thank you for dying on the cross for my sins. Please forgive my sins and give me and family the gift of eternal life. I ask you in to my lfe and heart to be my Lord and Savior; I want to serve you always”. your long comment will not influnce reader at ur last u said juses is son God but refuses to ur point no..17 to fight 4 cause Allah what a biased statement if u r worried 4 eternal life u should become a muslim and Allah will save u there not a SON. Alhamdulillah! All d long comment will neva make me change 2 christianity. Alhadulillah, all dat u quoted are command 4rm God on Unblievrs not a willingly action by d blievrsg. Since its a command, what can u say abt LUKE19:27 ”…for these enemies of mine, who do not want me to be their king and reign over them, bring them here and kill them before me..” So please read d Quran wit undrstndng and by following d context and also find any imam to trnslate for u. Bcoz 2 me u dnt knw arabic language and u dnt knw y those verses were revealed. Way to take that out of context…maybe you should read the whole thing instead of just the one verse…. You should always read the Bible in context to the other verses. Erphan Salis on the verse Luke 19:27, PLEASE READ BEFORE that verse. Jesus was speaking a parable. some of you mentioned above is right, except the 12 points in the beginning are wrong. in 1 islam means peace how can it be based on terrorism, islam is based on elections actually, islam doesn’t allow lying or cheating at all. actually the real musilm know these things and what you said show the opposite. i hope if you don’t like islam let other know the truth. peaceful on you. 2. When individual lies for her friend to save his/her marriage, only under one condition that other one, for whom he is lying, will never do anything that might jeopardize his marriage again, otherwise he is obliged to tell truth and nothing but truth, because on a judgement day he/her will be judged, punished or forgiven for his actions. This article seems to be slanted more towards Islam than Christianity. Their ‘practices’ of Christianity are not correct. Christianity is not something you go do on Sunday, it is a lifestyle. Also, there is no ‘penitance’ for sin, it is repentence. Christianity does not teach that you do good works to pay for your sins either. You should do a little more research on it before you decide to write an article as fact. Please see the original texts if Quran (the only one Quran) and the Bibles, you will see they are similar. So the fact narrated in them is Bible predicts of new Profit’s coming. Quran is the last of the God’s revelation to Mankind, in continuation from Noah, Abraham, Moses, Christ and Finally Mohammad. Same God, Same Massage. The problem is that the Clearest Message of God in Quran is being opposed by the some powerful people and misguiding the rest. You dont need to change your faith. Just read Qurab once, please, with a “neutral mind” and you decide for your self, whether it’s Good or otherwise. Thanks for making this page, difference between Islam and Christianity. I note some very good descriptions, but a few places where clarity could be conveyed. Muslims use the Quran, Christians use the Bible. Both do not think that acts get one “in good” all alone. Both indicte the necessity to submit to something other than oneself. Both forbid certain activities that until recently were termed ethics and morals. Both guided all manner of life, and in surprisingly similar ways. It appears to this person there is a near duplicate message and fallible humans who interpreted this message differently owing to the nature of Man to think we are the center of everything, that what we think dictates everything, when the opposite is generally and usually true. I came here wondering if there is evidence Mohammed and his religion derive from the Abrahamic god/God/ as does Judaism and Christianity. Thanks again for taking time to clarify this, so that I could leap-frog your good work. Jerusalem is the one and only Holy city. Although I was not raised in a Christian family, I accepted Jesus to be my Lotd and Savior in my twenties. As I see it, we are all sinful. That’s why Christians don’t always represent Jesus well and Muslims don’t always represent Islam well. We’re human. That is why we all need a savior. The Jews thought that God would send them a warrior to save them from the Romans. But God sent them and the rest of the world something far greater in Jesus, so that we can be right with God once again just as we were in the garden. No other being suffered such a torturous death! And this was the son of God! So many of you compare teachings and lessons….all good, but it’s not about that….through Jesus Christ, we have a relationship with God himself. And this is not blind faith my friends! Prior to becoming a Christian, i had to ask myself, how can I believe in the Bible? Well, I have history and something even more compelling…there’s much evidence. This amazing book is written by more than 40 different authors, covering 3 different continents, written over a span of 1,500 years, with thousands of eye-witness accounts. Hence, it was not written by ONE man in a cave. Furthermore, through the course of history, there have been over 25,000 archaeological digs performed, most of which confirms the validity of the Bible. Lastly, I needed to come to terms if Jesus is in fact the son of God? He was either what He said He is or He’s a psycho, there’s no in between in this! Every Muslim that I’ve talked to says that they love Jesus, but that He points to another…Muhammed. But if they accept His message, why would there be a need for another? He gave His life knowing full well that He needed to die on our behalf! What more needs to be done?! I pray that we enter into our faiths with hearts and eyes wide opened, not being persuaded by family, friends, politics, nor culture. Jesus is the only being in history that chooses love above all else; love our Lord with all our heart and love our neighbor as ourselves. This is the ONLY God that calls us to love our enemies as well! It’s easy to love those that are likeable, try loving those that aren’t. With all the hatred in the world today, we can sue people or blast our enemies to smitherines, but they won’t respect us for it! Exemplify love, that’s what changes lives! To all readers and seekers of truth, investigate with your heart, mind and evidence and decide for yourself if Jesus is who he claims or not, I dare you. Christians may do most of their formal worship on Sundays, but also are taught to adhere to the 10 Commandments at all times. Um…..i cannot say anything but nice page.